BugE - More than a bike, less than a car: Unusual problems found with "normal" use patterns. Unusual problems found with "normal" use patterns. Here's what I've found so far as the BugE is used for it's intended use - a pure electric commuter vehicle that operates in cool rainy conditions while keeping the occupant free of windchill and rain. First, in terms of BugE specific issues, I've noticed more tire wear with the front two tires with little wear on the drive tire. This suggests my 'toe' is out of adjustment. I'm guessing too much toe-in. So, an adjustment of the steering rods will be needed. Fortunately, this is a simple task. Visit the express links on the right to see how this is done. Another unusual incident happened. It has to do with the BMS system. This type of BMS is no longer sold and has been replaced with a more reliable system. Unfortunately, I have the older setup. So, I came home to find the meter showing my batteries were rather low . I knew this, only due to noticing the BMS indicator lights were completely off. What apparently happened was that the DC-DC converter was doing a steady draw down of the batteries to power the BMS. However, the BMS wasn't triggering the AC charger to replenish the main pack. Finally, the DC-DC converter had the sense to cut off. However, the lead-acid battery discharged completely (turning off the BMS and it's indicator lights.) I'm sure the lead-acid battery took some damage but it's duty is normally rather light. So, it may have survived well enough to remain in service. Fortunately, the main pack was not completely drawn down, just low. The cause was apparently due to a faulty LIN HUB. It failed such that it would only work if I bent the connector. When bent, all components seemed to work. When not, nothing worked. Unfortunately, when I tried solving the connector problem by trying to solder on a more robust replacement connector, I managed to loose what little function that circuit board still had. Unfortunately, it's a multi-layered board so it's beyond my ability to repair. So, I removed the board, did an unbalanced charge of the pack to 50V and eliminated all parasite loads. Although 50V was not a full charge, it hopefully kept the lithium batteries in a safe state. Meanwhile, my vendor shipped me a replacement hub. Once replaced, the BMS returned to normal operation. Hopefully, the batteries are OK. We'll see if this is true in the next range test. The last failure was severe enough to get my BugE trucked home. At times, if I accelerated even slightly, the vehicle stopped. After powering the vehicle on/off several times, the problem would go away. When I first noticed this, I thought the fault might be in the spade connectors I used for the throttle cable. So, I soldered the throttle wires to the speed controller inputs. This helped for a while, then the failure returned more often. So, this caused me to think the throttle potentiometer was at fault since it seemed to have similar symptoms to my previous throttle failure. But no, these electric cars can be sneaky. Testing out the various components with a multimeter showed what the real cause was. After putting the rear tire up on blocks, I measured various voltages along the system. I found the potentiometer in the throttle was working just fine. However, the contactor (also known as the solenoid) was giving a voltage difference across it's terminals when engaged. This was not good since it's supposed to simply act as a hunk of wire between it's terminals when active. In fact, that's how I tested my hypothesis that the solenoid was at fault. I put a hunk of wire across the terminals. Sure enough, the motor driven by the speed controller worked just fine. 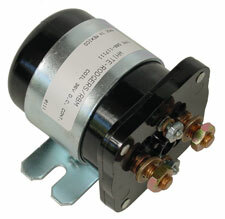 So, I've ordered a new solenoid, at nearly $100 bucks. Hopefully, after installing the new one, I can take apart the old one to salvage it for a spare. It did cause me to question why these solenoid's are needed at all. For an explanation, look HERE. Lose the BMS. It's unnecessary and is more likely to either kill your cells or start a fire than it is to help your cells in any way. Instead, bottom balance your pack and slightly undercharge the cells. 3.6v or 3.65v per cell (57.6v or 58.4v respectively) should suffice. Use an intelligent charger, such as the Elcon 1500. It will shut itself off automatically when the desired charge voltage and current is reached (I'd choose charge curve #500 for 3.6v or #502 for 3.65v). You'll find charge times of about 2 hours at 120v or 1 hour at 240v, and the charger can do both. I also suggest using a Tyco EV200 contactor and a precharge resistor instead of that puny solenoid. You're most likely burning it out driving that kind of current through it on a regular basis. And finally you might consider using a TBS E-Xpert Pro or Xantrex Link Pro as your battery meter. It gives you state of charge, voltage, current and a host of other data. The biggest advantage is you can wire a resistor across the throttle pot and attach it to the alarm of the meter, which will put the BugE in a "limp home" mode when you reach the end off your charge (the suggested 80% DoD that keeps your batteries healthy). Thanks for the advice. My BMS consumes enough power that I'm wiring mine so it's off except during charging and during trips. I'll check out the solenoid. The one I used did fail rather quickly. On the whole, the recommended BugE kit from EV parts was a little too cheap. Little by little, I'm upgrading to the components I should have bought in the first place. But hey, live and learn. If I initially saw the full-boat price for the higher quality components, I probably would have thought the kit was too expensive! September 30, 2011 - My first commute!